✔ TENNIS ELBOW PAIN RELIEF: Suffering from Elbow Tendonitis or Golfer's Elbow? 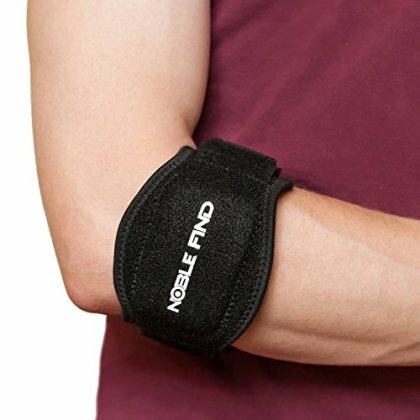 Our elbow brace will provide immediate pain relief. People that are prone to Carpal Tunnel Syndrome or have Arthritis can also benefit from wearing our braces. Any activities that could result in hyperextension of the elbow would greatly benefit from the use of our elbow brace. ✔ EASY TO USE: With the easy to follow included instructions applying our brace is a breeze. Two adjustable straps allow maximum adjustability. ✔ SUPERIOR DESIGN: Our design team went through great lengths to manufacture the most superior elbow brace on the market. From the softness of the neoprene, to the width of the brace, to the actual sporty appearance of the brace. This is truly a one of a kind brace. No other brace on the market can compare. ✔ 100% MONEY BACK GUARANTEE: No questions asked. Click the ADD TO CART button now and try our product completely risk free!